I don’t ever remember eating a zucchini, until this summer. I’m not sure how I could have gone almost 28 years of my life without ever having tried a bite of zucchini, but quite frankly I don’t think I ever had much of an opportunity. I didn’t even know what a zucchini looked like. I hang my head in shame. 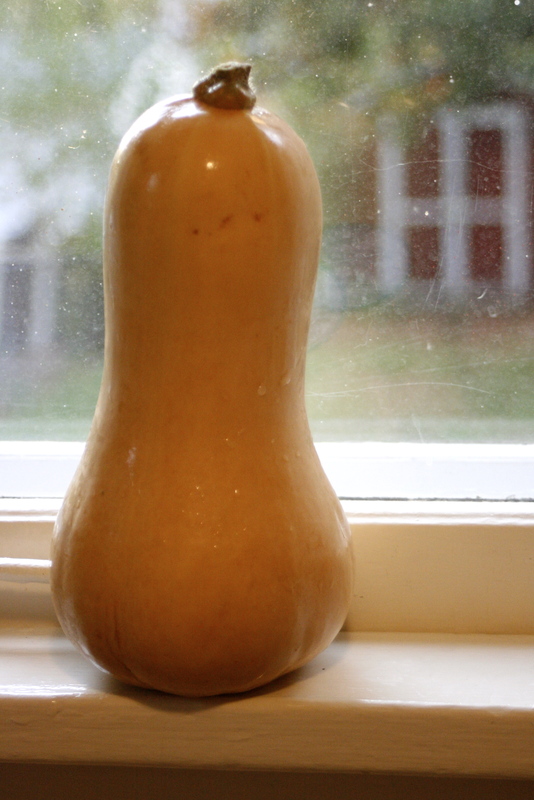 As for squash in general, I’m afraid my experiences aren’t much more sophisticated. I’ve always had a vague knowledge that a pumpkin is a type of squash, and that it can somehow be put into a can, which is then used to make pies in November. One time, a few years ago, I had a butternut squash soup at a fancy restaurant. I felt really brave for eating it, even though I had no idea what a butternut squash was like, except orangish as a soup. All that changed at the farmers’ market this summer. I picked up a funny little yellow thing that they told me was a summer squash. I think I may have asked what to do with it. It was lying in a basket next to some similar looking green things, so I got one of each and lo and behold, summer squash and zucchini made their debut in my life. I’m pretty fascinated with squash these days. Summer squash is easy to grow and can be thrown into almost any dish to add flavor and heartiness. Winter squash is a whole new world that I haven’t even begun to fathom as of yet. I don’t know quite what to do with them, but I do know that they are more than just beautiful as decoration, and they have really awesome names, unlike most vegetables: Carnival, Fairytale Pumpkin, Delicata, Gold Nugget, Turban, Spaghetti, Golden Acorn! When I think about the culinary possibilities of squash, I feel like Bubba with his shrimp. The possibilities are endless with such a versatile fruit! Squash can be baked, it can be fried, it can supplement stews and pastas and rice dishes, it can be served raw with dips though I wouldn’t recommend it. Squash makes pies, it makes soups, it makes casseroles and breads and even cookies sometimes. You can keep your Thanksgiving decor piled up on your centerpiece and it may still be edible months later! My favorite part about squash, though, is its bang for your buck. Not only are they outrageously nutritious and delicious and durable, but they are insanely inexpensive! 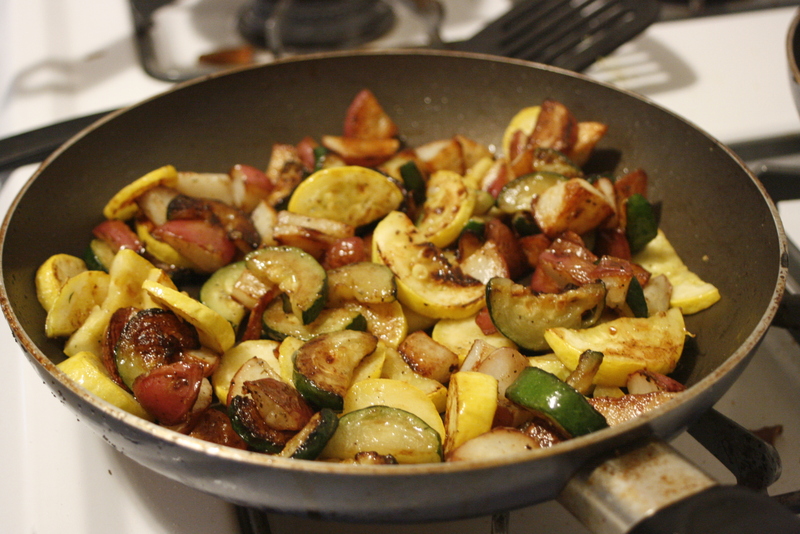 Just tonight I made a hearty meal for two, using just $2 worth of summer squash and red potatoes. I even used the expensive kind of potatoes, and came up with a $1-a-serving meal. Yum. Now, this guy was a bit more expensive. At almost $4, this was the most pricey thing in my shopping basket. I’m not quite sure exactly what to do with it, but I’m sure it’s going to fill our bellies with delicious goodness, and is going to be worth every one of those 377 pennies..
I’ve been eyeing those decorative piles of autumn edibles at the grocery store with a new eye these days, and I’m looking forward to getting to know the squash family as if it were my very own. Only more tasty.